With last weekend’s tear-gas attacks on asylum seekers at the U.S.-Mexico border, it is clear that the Trump Administration is continuing to embrace new levels of barbarism and brutality in response to what is essentially a global refugee crisis. On Oct. 12, a few hundred people set forth from San Pedro Sula, Honduras — one of the most dangerous cities in one of the most dangerous countries on Earth — and began walking to Guatemala. They were not an organized mass, and hardly a “caravan” — but moving en masse provided them protection and visibility. They traveled on foot, parents pushing strollers and carrying their babies on their backs. More joined as they walked. Men, women, solo teenagers and small children, walking for miles and miles, their feet swelling and pocked with blisters. By the time they entered Mexico they numbered in the thousands. By one report, there were two dozen pregnant women. By all reports, they were making their way, one step at a time, toward the United States. In the run-up to the midterm elections, the Trump Administration and the Republican Party quickly branded this group a “migrant caravan.” Trump stoked fear and division by calling them “invaders.” He ordered federal troops to the border and dog-whistled about the need for lethal force; he pushed through a dubious executive order to drastically restrict asylum. As he has done throughout his administration, he reacted by sowing hate and racism and division. When the leading edge of the caravan finally arrived at the border, it was no surprise that they were brutally attacked. Sadly, such brutality is not unique to Trump’s America — it is just the latest manifestation of the United States’ policy towards our southern neighbors. It is no secret that U.S. foreign policy in Central America over the past several decades has consisted of massive economic and military support for dictators and death squads. From the 1954 CIA-backed coup that overthrew Guatemala’s democratically-elected leader to the strategic use of Honduras as a base for the U.S. Contra assault on Nicaragua in the 1980s to the U.S.-backed 2009 coup against Honduran President Manuel Zelaya, it is no exaggeration to say that the conditions of life for people in Central America have been fundamentally shaped by U.S. militarism in the region. This summer, a drought in Central America’s Dry Corridor that runs through Honduras, Guatemala, Nicaragua and El Salvador destroyed 80 percent of the region’s maize and bean crops. By August, Honduras declared a state of emergency. By September, what should have been a time to harvest became an exodus, another in a long line of migrants who’ve left Honduras in recent years. The wave of people working their way northward from Central America toward the U.S. southern border are driven by violence and instability, by political repression, by extreme poverty — they are driven by hope for a better life, by aspirations for peace, by dreams for themselves and their children, by a belief in their own fundamental human dignity. And they are driven by hunger. Hunger caused by drought, drought caused by climate change, climate change caused by the reckless burning of fossil fuels and the heedless conversion of land for mines and dams and plantations and the growth of cities. 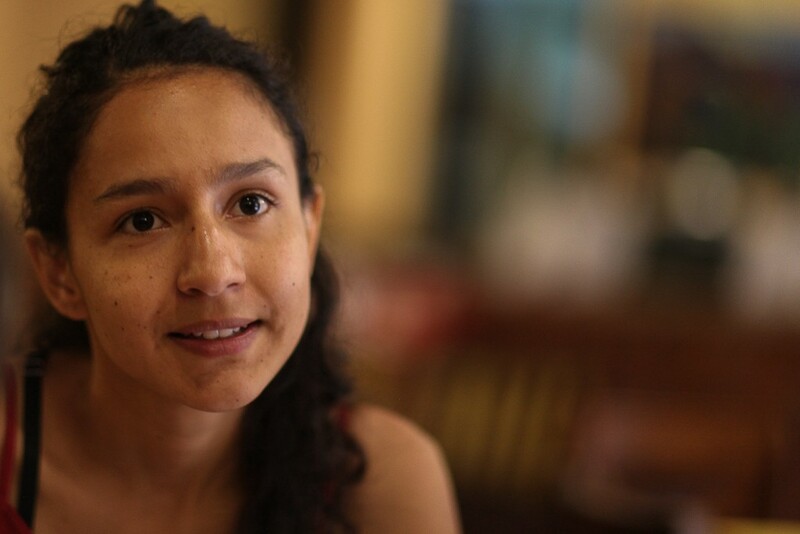 In late October, I had the opportunity to interview Bertita Zúniga Cáceres, the 27-year-old daughter of Berta Cáceres, the Honduran indigenous leader who was gunned down in 2016, a year after being awarded the Goldman Environmental Prize. (I was one of Berta’s nominators for the prize, and had written about her on several previous occasions.) At UC Berkeley’s law school, where she was preparing to give a talk about the role of law in human rights defense, I spoke with Bertita about the trial of her mother’s killers, which has since concluded with a guilty charge against four of Berta’s killers, the conditions of instability in Honduras and the reasons for the mass exodus from her country that has come to be known as a migrant caravan. Bertita Zúniga Cáceres, daughter of Berta Cáceres, the Honduran indigenous leader who was gunned down in 2016. Photo by Carlos Sebastián, via Nomada. Jeff Conant: Is there any hope that there will be justice in Honduras in the case of your mother’s murder? Bertita: Yes, of course there is hope. Just our presence and the work we do is to achieve justice. However, we have been facing the many barriers of a justice system that normally does not prosecute for this type of crime. So we are trying to challenge an arbitrary justice system aligned with certain economic interests. As we always remind ourselves, the crime against [Berta] reflects the social problems of our country: the violence and aggression that have brought private interests to political power. It’s a great challenge to achieve justice and denounce all the wrongdoings that have been present throughout the process. The justice system has always ignored the presence of victims of state violence in our movements. Surely, during these days we will see a result, perhaps the first conviction. [Note: this interview was conducted during the first days of a criminal trial of Berta’s suspected murderers. Some weeks later, irregularities in the trial have prevented a just outcome.] We always say that convictions are not synonymous with justice because many more people need to be convicted and because this trial is based on the arbitrariness of failing to address the more contextual issues that need to be addressed when a person is murdered for political reasons. Our fight has always been based on reaching the truth and on challenging the justice system. However, under this dictatorship, working toward justice is very complicated. JC: Your work and the work of COPINH (the Council of Popular and Indigenous Organizations of Honduras, in which Bertita has succeeded her mother as coordinator) is about environmental protection, land rights, indigenous rights and women’s rights. For a U.S. public, environmentalism can sometimes feel a bit removed from issues of poverty and justice. How do you see the connection between poverty, human rights and environmental conservation in the Honduran context? Bertita: I speak for indigenous communities that have experienced a history of displacement and land grabbing. Despite this, indigenous people have the most harmonious relationship with nature. Today, we manage the most important water, mineral and forest resources. Obviously, there are economic interests sustained by extractivism in Latin America, and therefore indigenous land is of interest to corporations. They come to our countries with a discourse of supposed “development” and improved living conditions for communities. However, this discourse of development is the same one that has lasted 526 years in Latin America, especially for indigenous territories that have never seen this development. What we always say is, “Development for you is increasing profit, increasing the wealth of the same oligarchs who have always been rich.” Often the extremely poor still buy into this, because that’s part of the charm the companies have over the poorest and most deprived communities. So of course there’s a connection. For us, natural resources are the greatest wealth we need to survive in the midst of impoverishment — but they are also a source of wealth for corporations. Even when it’s about issues like renewable energy, clean energy, as long as it means profits, it doesn’t matter what the cost is or what means are used. I speak for indigenous communities that have experienced a history of displacement and land grabbing. In the case of my mother, it is one of many murder cases that demonstrates how companies are willing to do anything — and in our country they are absolutely sure that they will never be prosecuted. That is our struggle: a fight that seeks justice for a specific case but aims to address a structural issue in the country. JC: We know the United States government has had a role in Honduran politics for the entirety of the modern history of Central America, including in the 2009 coup. How are issues of extreme poverty in Honduras connected with U.S. politics and financial interests? Bertita: I believe that all “first world” countries have participated in exploitation, and they intend to continue doing it. There is a direct relationship between that and the private interests exploiting Honduras and Central America. Even with the energy transition debate we are seeing in the world, to increase renewable energy for measured consumption in Central America, Honduras is viewed as a potential energy producer and an energy corridor, not in terms of its own need for an equitable energy supply. To the social movements, it is evident that the role of the United States in our country has been to push anti-democratic and non-participatory processes. Clearly the fact that people are leaving means there is a need to restructure our country, it means pushing the state to uphold laws that would allow improved social processes for people who have been historically excluded. We’re seeing people fleeing the country now due to the United States’ backing of these anti-democratic governments. The dictatorship in Honduras is extremely violent; it is led by violent corrupt people, high-ranking people in the armed forces that take part in organized crime. Even in the case of my mother, a major in the armed forces, an instructor of the military police, was involved. That is not an insignificant thing — not an insignificant message for the government and the military to send. And there is a lot of evidence. [Note: see the Guardian for more on this.] The United States has greatly supported the illegitimate Honduran government. This is unconstitutional, but we don’t say anything about it. When there is corruption, violence, lack of democracy in Venezuela or another country, it’s a scandal. But when it is Honduras, which has perpetrated some of the largest examples of fraud in history, nothing is done and nothing is said. There is a lot of hopelessness because of that. JC: Now we are seeing the arrival of this caravan. They are calling it a “migrant caravan” but of course it is a caravan of asylum seekers. In your opinion, who are they? Why did they leave Honduras? What are they looking for and what does this have to do with extreme poverty and lack of justice? Bertita: It has everything to do with why people are escaping. They are escaping extreme poverty and violence. Something that we talk about in Honduras is that the majority of people in the caravan are from urban areas like San Pedro Sula. Obviously not all, there is a diversity. But what this means is that in urban areas there is more violence by gangs, organized crime and the military. The people are fleeing from that violence and unemployment. The largest part of the government budget goes to the military, not to education or health; there is a large structural issue of corruption that has prevented people from accessing these fundamental necessities. There are scandalous crimes of corruption involving the most important and powerful people in Honduras — and nothing happens. They are simply trying to survive and to support their families financially so that they can escape from this reality. You hear stories of mothers traveling in the caravan with their children who earned 5,000 lempiras a month [about $200 USD] and had to care for eight children. So people say, “Our country is violent and there aren’t job opportunities. What do we do to live?” It is a hard, violent journey. These people are not wanted in the U.S., but it’s the same in Honduras. It’s a violent place. Many people feel disillusioned after having tried to change the country. People have made every effort, have done everything they can do and nothing changes. People are afraid to protest, they are afraid to denounce anything. They know that you cannot count on justice. They are simply trying to survive and to support their families financially so that they can escape from this reality. JC: Hondurans are well acquainted with the criminalization of activism. Members of the Libre party [the left-wing social movement party] are accused of organizing the caravan, because this will stigmatize the caravan. What are your thoughts on this issue? Bertita: Dictatorships have a very fragile image to uphold because of the violent crimes they’ve committed. So anything that demonstrates how repressive the state is, how the state displaces people from their lands, their communities, their country even, that is a threat to the government. They are so afraid of criticism of the real issues facing Honduras because they know that the entire government is there illegally. They know that there is a mass hatred of them. Therefore the state’s response is to try to intimidate, to try to silence, to murder those who resist. Our country has those politics, it has cases like what happened to my mother. The fact that people are fleeing the way they are, in the numbers they are, knowing the conditions they’ll experience, that makes the government look bad. So the Honduran state is using all of its power to prosecute and criminalize. It is using the media that is aligned with government interests — there again you see that pact of private and political interests. I believe that all sorts of things have been done to prevent the Honduran people from fighting. Criminalization of dissent, like what they did to my mother before she was killed, is intended to sow fear and paralyze people. It is a form of restraint — a way of trying to stop Hondurans from pushing for change and identifying the government as enemies of the community’s interests and of the Honduran people. But the Honduran people, we are fighters. We will not stand by with our arms crossed in the face of our oppressors. JC: Finally, this caravan is an opportunity for the United States to learn something and do something about Honduras. What can Americans do and what should they do? Bertita: The caravan is an indication that what is happening in our country is not right. There is an opportunity by the United States to pressure this government; they have a lot of influence here. If the U.S. does not want any more immigrants, then it should stop supporting the Honduran government’s violence and murders. I think that for us, this migrant caravan is an indication of a humanitarian crisis and the people coming to the U.S. should be received as such. In the midst of so much hardship, we saw solidarity in Guatemala and in Mexico. People gave food and brought medicine and played music with the caravan. But the U.S., a country that is made up of immigrants from all over the world, how can they be afraid of people who are fleeing violence? Rather, there is a duty to welcome and receive people and help them settle here so that they don’t have to live through more violence.There is a duty to try to understand what happens in our country and why people are fleeing.